One of our original RSDS Advocates, Mary LaBree, passed away on October 15, 2015 due to complications from Reflex Sympathetic Dystrophy (RSD). Mary exemplified commitment to the RSD community for over 3 decades. 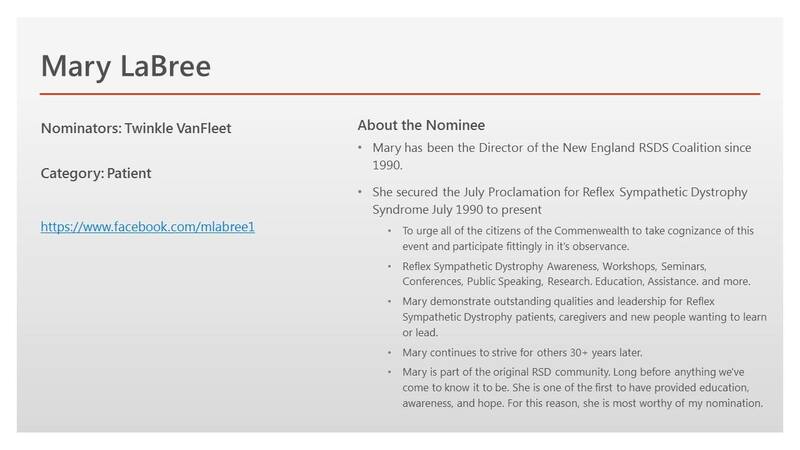 As the Director of the New England RSDS Coalition since 1990, Mary sought to educate and bring awareness to the public and private sectors for the disease that was virtually unheard of back then. Originally from Leicester, Massachusetts, she was formally educated at Worcester State University in Worcester, Massachusetts. She worked both locally in Massachusetts and Nationally. Mary formed and lead seminars, attended others, developed awareness events, distributed information and educational materials. She spoke with patients, caregivers, physicians, hospitals, insurance companies, fellow educators, universities, other peer groups, and those with an interest to learn about Reflex Sympathetic Dystrophy. She was involved with grants, research and fundraising. When Mary LaBree began advocating for RSD in the 1980’s the term Complex Regional Pain Syndrome hadn’t been created. While other names had been used previously to describe Reflex Sympathetic Dystrophy (Syndrome) it was most often referred to as RSDS. In 2012, she reached out to me and a friendship formed. We shared phone calls, messages and correspondence by snail mail. Mary sent me a copy of the photo of she and other’s of the original signing of her proclamation and a copy of the verbiage used to secure her proclamations. I’m privileged to know what Mary looks like. For now, I’ll not share those, nor have I ever. She shared with me 30+ years of everything. How she started, how she educated, how other RSD organizations began, her children, grandchildren, colleagues, the strength it takes to endure; not just in living with pain, but being a part of it. If you pray, why worry… If you worry, why pray? I had plans to meet her in person twice. The first time she had to return home early. I was supposed to meet her again toward the end of October or into mid-November. I had just spoken to her less than a week before her passing. I’m sorry I had a mistake that I didn’t want to have a group pls forgive me, as I pressed the wrong thing, & didn’t realize it until someone told me. The next message on Oct 12, I missed due to being away and my IM being flooded and then she was gone. I was on the road to and from the Stanford Transplant Clinic for our daughter on the 15th and in the Emergency Department on the 16th due to my cervical spine. Trying to save the puppies life all in between. The last message was in reference to an accidental group IM. I had been wondering if she would want to make the plans to meet at the NERVEmber, West Coast Pain Forum for Power of Pain Foundation on November 14th. All I knew for certain is she planned to be here in Northern California on the 23rd of October and would call me. I wish she would have received more nominations, but mine was the only one for her. She was most deserving. We never know for certain where our conversations go even when we chit-chat on the phone or when we think they are in confidence. I don’t know what Mary ever spoke of me to others, but I know that she must have believed in me enough with what she did share with me to know I would keep it to me and if she didn’t know for sure when she told me she knew as time went on because I’ve never told it. She asked me sometime in 2013 to consider being trained by her for her Coalition and new endeavors. While I was most honored, I respectfully declined as I was already committed to Power of Pain. Our conversations also consisted of but weren’t limited to life, color, ethnicity, race, the olden days, differences, equality, change and today. She shared with me uncertainties about people, places and things, and I eased her in certain fear and prejudices. Please don’t misunderstand me, I’m not at all implying Mary was prejudice, in fact, she’s not, though conversations were simply sometimes deep. Mary listened and she learned. She watched, listened to gossip, dismissed it, listened more, read, picked it apart, put it together, and ultimately decided for herself. She wasn’t afraid to speak her mind or share a maybe, what if, what do you think or did you know. I’m humbled to have been accepted, acknowledged, taught and even loved by her. Mary was so proud of the New England RSDS Coalition, she was thrilled that the healthcare community was finally beginning to know what RSD (CRPS) is. She was pleased that patients had informational materials to seek out and be provided. She was happy that educational events were provided free to the public. She told me the story behind July and why her proclamations are for the month of independence and not November. As I stated Mary began educating RSD over 30 years ago. 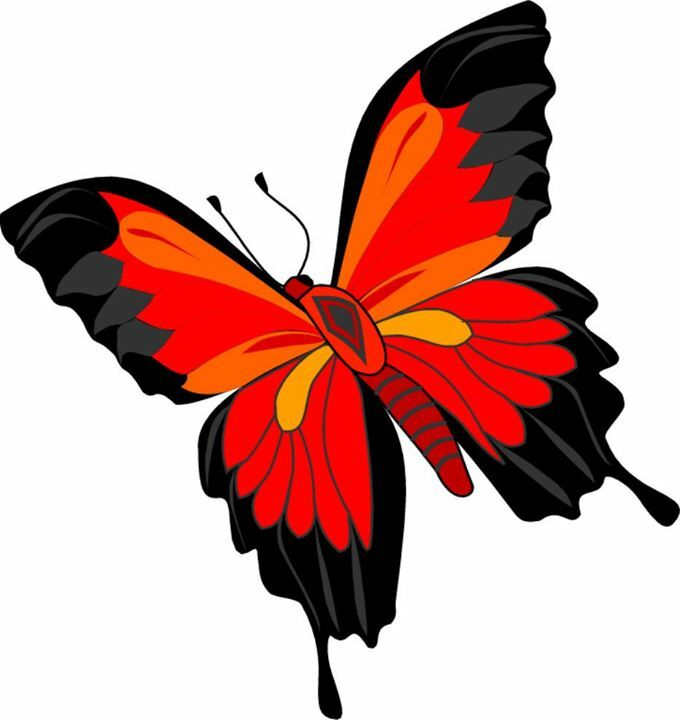 July was chosen for freedom, freedom from pain. It wasn’t until many years later that a national color evolved, and then our month of recognition. Mary was grateful for her closest friends. I know she loved her beautiful friend, advocate and poet, Jane (Gonzales). I prayed for her health and I prayed for her to achieve her life’s work, her mission to create awareness and educate on RSD, her purpose to continue doing so, and her hope for our future. You did Mary! You really did! You achieved them all to the last breath. Lets not forget the ones who started the path that gave way for us to do what we do. ~Twinkle V.
On behalf of all of us this one’s for you! Reference to Mary’s favorite quote shared above. The above is shared the way she said it.